It's been nearly a week and I still can't believe my first half-marathon is over. I've learned over this week, though, that there are some perks to running a half-marathon, in addition to the carb-loading and the runners high and the overall awesome feeling of accomplishment you get. In addition to people being thoughtful enough to remember and ask me how the half-marathon went (and some sweet texts and tweets), some of my favorite people gave me some awesome things. Yes, this post is about the great people that I'm lucky enough to have in my life. Sorry! 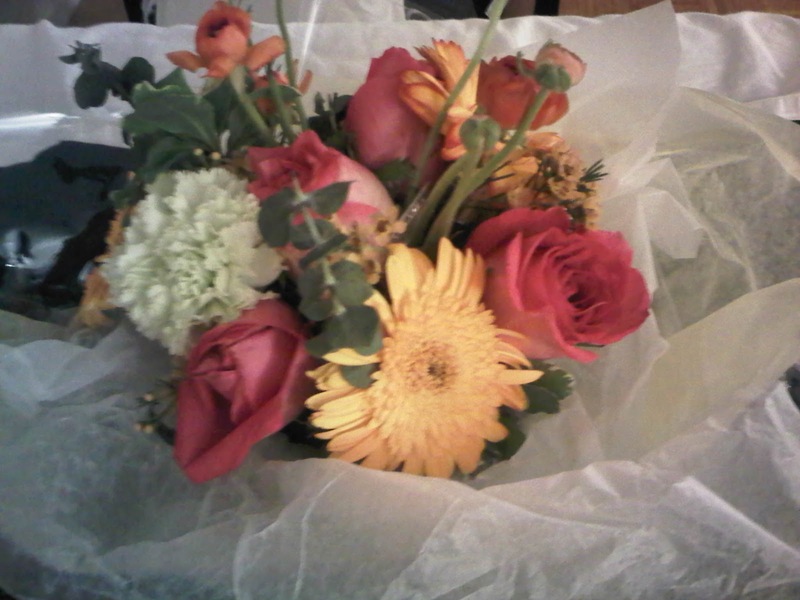 My parents sent me a really pretty little bouquet of flowers. It's adorable and sitting on my coffee table currently. It actually inspired me to clean my apartment yesterday because how can pretty flowers sit in a cluttered apartment??? They were totally unexpected and were such a nice little surprise. I sent a few strong hints that I wanted this necklace in silver. Ok, I pulled it up on my boyfriend's computer, selected the length, type of metal, and font I wanted, then gave it to him and said "a girl who is running a half-marathon would probably really like something like this" before leaving him with the computer. But technically I didn't know he followed through! Hey, I make it easy for him. And I love, love, love this necklace from Erica Sara Designs. It's really pretty and I love jewelry that has some sort of meaning attached to it. One of my favorite pairs of earrings is a pair of sparkly studs that I got from a street vendor on Portobello Road in London for our three-year anniversary getaway to London. It was like $12 but I wear them all the time and always think of London when I do. Now I have a gorgeous necklace to remind me of my first half-marathon! I bought the hoodie in a checked grey small-print houndstooth pattern that hides the pet fur that seems to cover every item of clothing I own. I've been wearing it everywhere -- it's perfect in the 40s to 60s weather we've been having! Do you believe in treating yourself for fitness accomplishments? I adore it and have been wearing it everywhere. Thank you! !